Professor Mazzotta begins this lecture by recapitulating the ambivalent nature of Ulysses’ sin and its relevance to Dante’s poetic project. Inferno XXVII is then read in conjunction with the preceding canto. The antithetical relationship between Dante’s false counselors, Ulysses and Guido da Montefeltro, anchors an overarching discussion of the relationship between rhetoric and politics. The latter half of the lecture is devoted to Inferno XXVIII, where Dante’s preeminent sower of discord, Bertran de Born, introduces the principle of the contrapasso. The law of retribution that governs Dante’s Inferno is discussed in light of classical and contemporary theories of justice/crime and punishment. In conclusion, the opening of Inferno XXIX is read as a retrospective gloss on the limitations of retributive justice. Professor Giuseppe Mazzotta: We’ll continue the discussion we left open last time. Remember we are — we were saying a few things about Ulysses. The overarching question of my remarks — and your questions actually took my remarks in a different and sometimes deeper direction than I had intended — is the whole issue of Ulysses but around Ulysses, Dante’s reading of what we call the Hellenic world. Around Ulysses — Ulysses is — appears in Canto XXVI with Diomedes who is silent. Ulysses, the polytropic intelligence of classic antiquity, the crafty mind is — he appears as a philosopher, but also as a rhetorician and this is exactly that kind of complicity between the two modes that Dante wants to explore. Let me continue with this overarching theme. The overarching theme is the reading of the Greek world. You remember that we saw Eteocles and Polyneices, that clearly for Dante is — the knowledge of which is filtered through a Greek Roman poet, Statius, who was born and lived in a Greek Roman city, Naples. So he’s discussing through Eteocles and Polyneices the whole story of Thebes. The two brothers, who are enemies, the enemies-brothers, and therefore the tragic history, the tragic knot of Theban mythology. It is Diomedes who is silent and — but above all the focus of the canto falls on the greatness of this hero. Ulysses, who I repeat, plays a pivotal role in Dante’s imagination. He is a paradigm, he has a paradigmatic role. Dante can’t quite get enough of him, nor can he get over the phantasm of Ulysses. Ulysses literally appears in his dreams in Canto XIX of Purgatorio, and then Ulysses will also appear when Dante has to measure the great imaginative distance that he traveled when he’s at the border of the physical and the metaphysical worlds. He looks back and he will see Ulysses, or he’ll remember — he will see the place which has been the place of Ulysses’ transgression, because this is apparently Ulysses’ sin. Ulysses’ sin is to have counseled his companions to go beyond the boundaries of knowledge. This is — so, it’s the effects of counseling. Let me just say one thing, that for Dante there’s no figure which is more interesting, more important, more full of — for whom he has so many questions than the figure of the counsel. A counsel was of course Pier della Vigna, how does he advise? How does he take the pressure? He’s the secretary, the counsel. How does he take the pressure of the court? What does he counsel Frederick the Great, his emperor? And then we’re going to see other counsels. We’re going to find very soon, later today, a Provençal poet who literally advises war between father and son. He divides father from son. He breaches the unity of the body politic and we’ll come to that in Inferno XXVIII. This is grandiose advice that he gives. Grandiose advice, but which has one little problem that Dante places him — and that’s not necessarily the major problem — he places Ulysses and his companions as they are going to go beyond, as they are going beyond the Pillars of Hercules. It is as if Dante implies and seems to agree with, if one were to read the trajectory of the Divine Comedy, that there is no knowledge worthy of its name unless it is connected to some degree of transgression. That somehow transgression is part of knowing, of an original and new knowing. Ulysses has to go beyond the limits of the known world in order to truly uncover, discover something anew that nobody else knew. That makes him, as they used to say, a Renaissance figure avant la lettre; that’s the way he’s known. There is the famous joke of Ulysses, and the graduate paper refers to Ulysses as the great hero who is with one foot firmly rooted in the Middle Ages and with the other one, he salutes the rising sun of the Renaissance. It’s a little bit of a comical account of Ulysses but it gives you a sense of how — the novelty that he represents. There is this bit of a transgression, but Dante doesn’t seem to be terribly bothered by it, since he himself, in the different circumstances, is engaged in exactly the same kind of transgression of the perimeter. Apparently the geographic, even the cosmic, perimeter, he goes beyond the sun. He’s even — he even goes farther than Daedalus and certainly farther than Icarus: these other mythical coordinates with him. How does Dante find out — how does he want us to know that somehow the promises Ulysses makes to his companions — he wants to lead them to virtue of knowledge — may really be a faulty promise. This is, I think, the substance of the canto. Dante will refer to it with a famous metaphor as a “mad flight.” Remember Ulysses recounts how they made — a mad flight out of the oars, mixing metaphors as Dante had done before — the maritime journey and the air journey. This is the journey, the flight of the mind, the flight of the intellect as if it were described by a sailor; Ulysses is a sailor. How does Dante make us aware that this is indeed — there is madness in what Ulysses is trying to accomplish? Very simply, he puts him within a peculiar, distinct political and rhetorical context so that you really have to wonder: can he really deliver these promises and what are the political consequences of the promises that he makes? The whole Canto XXVI is literally littered with fallen cities. From this point through it begins with Troy — I’m sorry with Florence — Dante has this apostrophe against the city of Florence: the city of Thebes, that’s what he calls it, spreading its wings as if it were also — as if cities were like heroes, engaged in great flights. That is a clear desire on Dante’s part to have us connect the story of Ulysses’ self-degradation, turpitude, with the story of Ulysses, Florence’s turpitude and Ulysses’ own fall. Then there is a reference to the city of Troy, a fallen city. There is a reference to Thebes with — through Eteocles and Polyneices. There is also a reference to Rome. The canto is full of references to cities from this point of view. Canto XXVI is a version — a brief version — of the epic, because the impulse of the epic is always political. There is no epic that you can think of which doesn’t think about — it’s not trying to represent the — either the falling cities and the edification of new cities, or for that matter, some locating of a city that could be in a great, grand metaphysical drama. It could be in the heavenly Jerusalem, or it’s Rome, it’s Carthage, it’s Thebes. Falling cities and rising cities: so this is the strategy of Dante. Dante’s strategy is to show then how the grand philosophical claims of Ulysses have effects that make it appear as empty rhetoric. Dante places Ulysses nowhere, somewhere in the ocean without a particular place. He goes from one city to another, and at the same time because of this, he can never quite — doesn’t seem to be able to deliver on what he has promised. It’s a reflection on one particular aspect of the tragic story of Ulysses. It’s the tragedy of language: a language that contains with itself all the most incredible mirages and yet, it falls short of reality. Ulysses is literally placed in the empty ocean away from all responsibilities and all locations, and it is this gratuitousness of his quest that also counts for his being in Hell among the evil counselors. This is what I was trying to tell you last time and I think that I have added on today a few other details but we can go back to that if there is to be a discussion, and I hope there will be, a little later. Let me turn now to Canto XXVII which I really like to read in conjunction — it should be read in conjunction with Canto XXVI, because here we have what I would call a counter myth to the story of Ulysses. There is a contraction of focus; there’s even a revision of the claims of epic grandeur that we have in Canto XXVI. Dante meets, and he’s the one to become the interlocutor of, Guido da Montefeltro, an extraordinary figure, a political leader, that’s what he was, who then experienced the conversion. He became a Franciscan friar and historically — this is a historical figure — historically he is called in by the Pope Boniface VIII, by now you know him. He’s not someone that Dante really holds in the highest esteem possible, but Boniface VIII, in an inversion of the relations between priest and cleric, high priest and cleric, asks Guido da Montefeltro for some advice. We are dealing again with evil counselors and the advice is the following: you have to teach me, you are a great man of arms, you have to tell me what is — what are the strategies I should pursue in order to conquer Palestrina, a small town. You may know it as a place of — the origin of a great musician from there, but a small town near Rome. I want to conquer and destroy the city of Palestrina; you tell me how I am to do this. We’re really dealing with a Machiavellian world of counselors. For Machiavelli, it’s actually the language of Machiavelli avant la lettre. Machiavelli uses, takes the language I think that Guido will deploy for himself. At one point Guido says, my works were those of — not of a lion but of a fox, and you remember, these are the two attributes in The Prince of Machiavelli that the man — the perfect prince ought to have. That is to say, the perfect prince is the one who knows how to use strength, but how to use also slyness. You have to know when you have to be crafty and foxy. You have to know when to be violent and lion-like. Two images that clearly originate from Cicero. They are not Dante’s own invention but — and it’s likely that Machiavelli got them from Cicero, as well as from this canto. The connections between the two cantos are several. Let me just go — first of all, it begins — Canto XXVII — there is this reference to the Sicilian bull, clearly a counter to the Trojan horse of the previous canto. “As the Sicilian bull which bellowed for the first time — and it was just — with a cry of him who had shaped it with his file, used to bellow with a voice of the victim so though it was of brass, and yet it seemed pierced with pain; thus… ” etc. What is the story? It’s exactly the same version, a demotic, vulgar version of the great situation — of what has happened to Ulysses. Ulysses is condemned to be held prisoner of the flames and the two tongues of fire, literally tongues of fire, because here is a rhetorician, the philosopher, the neo-Platonist who actually is a rhetorician, trying to persuade others about his ideas, and managing, and being very proud of this — his success, but then he gets caught by his own tongue. It’s always the temptation of the artist himself, it’s Daedalus who builds the labyrinth and gets caught by it. It’s the story of the artist who becomes a captive of that which he himself is constructed. This is true for Ulysses, a rhetorician caught by his own language, and here Dante begins with a story of the Sicilian bull, the first victim of which was the artist itself. So I think it’s literally a way of reflecting on the scene that precedes it. Virgil and Dante are interrupted, line 20: “O thou to whom I direct my voice and who now just spoke in Lombard.” What an extraordinary little misreading of the language, of the rhetoric deployed in the previous canto. You remember in the previous canto, Dante has Virgil go out of his way to say don’t talk to these people — they are Greeks, so let me talk to them. But now from the perspective of Guido da Montefeltro — they are not speaking some kind of Homeric, Attic Greek, they’re speaking a dialect of Italy. Which is to say, that language — it’s not a question of what kind of style you are using, language always shows a sort of distance. It shows you yourself where you are and the kind of distance that you have from the world of truth, or the kind of proximity that you may have to some self-complacency, as in the case of Ulysses. This is a passage that most of you remember very well; you may know this very well. It’s a passage that Eliot, T.S. Eliot, uses an epigraphy, an epitaph actually, for “The Love Song of Prufrock.” So it gives you an idea of the kind of reading that Eliot has of his own modest — the solitary — this man Prufrock and the kind of infernal reality that this figure also evokes. What I want to emphasize though here, at the level of style, is how Guido speaks. Curses, hypothetical sentences, parenthetical remarks, not just a style that is — deliberately goes contrary to the smooth high — once again high style of Ulysses in the preceding canto. Then, “I was a man of arms, and then a corded friar, thinking, so girt, to make amends; and indeed my thought had come true, but for the Great Priest,” here is the curse against Boniface, “may ill befall him! — who put me back in the old sins, and how and wherefore, I would have thee hear from me. While I informed the bones and flesh my mother gave me.” Another reference to birth with which, as you know, characters start telling us their story. The making of birth, the first major event of their lives and then whatever happens, whatever biographical account may be a descent from or a deviation from the promises that that birth may have held. “While I informed the bones…” etc., “my deeds were those not of the lion, but of the fox.” This is Machiavellian — eventually will become Machiavellian language. We are moving into the secret halls of power. There where big deals are struck, big deals of the destruction of cities, where the pope will ask the secret advice from his counselor. Let’s see what he says. “I knew all wiles and covert ways and so practice their arts…” I cannot but remark to you how Canto XXVI also takes place through the language of concealment and covertness. Even which is — in Italian it’s actually the language for thievery at the same time, the furtiveness of it all. You remember Dante speaks of the sun through a periphrasis, to say that it was hidden, that sinners are hidden and concealed from view in the tongues of fire. This is the language of manipulation of the political stratagems and machinations and here it becomes highlighted and made visible to us. He continues the covert ways. It’s really — we are moving within the — I said within the halls of — we say the Vatican today, but at the time it was the Church of St. John the Lateran, which was the residence of the Bishop of Rome. And it was famous then as it is famous now, for the mosaics about Constantine’s Donation to Pope Sylvester. The whole issue of the temporal power of the papacy really is to be seen — it’s to be glimpsed through this scene of Guido and Boniface. This is the famous story of Celestine V, who gave up the office of the papacy and who stands even in the historical recollections and scholarship of today as the embodiment of one of a pope, of a figure who understood that the drama and the issue is always between power, maybe a little bit too dualistically, and holiness and how the two for Celestine were really incommensurable and cannot quite — there could not be a dialectic between the two and he gave up. Dante refers to him with a little bit of harshness for not being heroic enough and withstanding the tide of corruption and deciding to retreat to a contemplative life. “Then the weighty,” let me continue — this is a little sermon that I apologize for, let me continue with this.” Then the weighty arguments drove me to the point where silence seemed to me the worst offense and I said,” and this is the advice he gives: simple and spectacular in its simplicity, “Father, since thou dost cleanse me from this sin into which I must now fall,” I love the “I must.” I cannot — I find it so irresistible especially because now I am guaranteed of this absolution, I can really go on and do whatever I want. So there is not just a coercion on Guido, but a kind of pleasure that he feels. He feels now that it is a necessity for him to go out and perpetrate — and commit the evil he will perpetrate and this is the advice: “Large promise with scant observance will make thee triumph in the lofty seat.” What is he saying? Make promises and plan not to keep them. Go and tell the people in Palestrina that you are going to respect them, that you are going to make them even rich, whatever you want to tell them. Then of course, as soon as they open the gates of the city, don’t keep any of these promises. This is the — a restatement by the way that one — that finds its original source in Cicero’s text about rhetoric which is known as — it’s not really Cicero’s but it was thought to be Cicero’s and this is the text. From the person to whom it was dedicated, it was meant for this Ad Herrenium. It was thought in the Middle Ages to be Cicero’s rhetorical treatises and the rhetorical treatises is based — all treaties — like many other treatises are based on one premise, that rhetoric is the art of making the city and the citizens agree in order to keep the city going. In a properly governed city promises are made and are always going to be observed. It’s a way of explaining rhetoric in moral terms. What Dante’s saying is those kind of dictates, those kinds of propositions can easily be turned around and they are being turned around in the practice, the historical practice. “Then, as soon as I was dead, Francis came for me,” there is a little rivalry between Francis and the devil, fighting over the soul of Guido and Guido is — Francis loses and Guido is, of course, here in Hell. I mention these details because you will see that Dante will pick up this genre of medieval disputation when — later in Purgatorio — in a couple of weeks we’ll hit the canto where Dante meets Guido’s son, because in this poem fathers and sons do not necessarily belong in the same moral space and sons do not necessarily follow in the footsteps of their fathers. So you will see how Dante echoes this whole scene and this is a kind of pre-figuration. I’m giving you a pre-figuration of things to come. Then we come — and I really want to pay a little bit of attention to this Canto XXVIII because we’re entering the world of the truly tragic world, the tragic — the most tragic section of the Divine Comedy. And I mention that because from here to Canto XXXIII, the story of Ugolino, we’re going to talk about what does Dante think of tragedy and how can he go on really envisioning the tragic. After all, I just called the poem, as he calls it, a comedy. What is the role and the place of the tragic? Is there room for the tragic vision in Dante’s comedy? The point is that the tragic — I want to make this point now and I will be elaborating it as we go on next time — especially next time — the tragic is never the final vision. I will go on even saying something now that the essence of tragedy is always linguistic for Dante. It has to do with issues of the inherent ambiguities of language, the impossibility of decoding and deciphering what is being said by one particular — by one statement as opposed to another. Here Dante begins then with a reflection about tragedy. Where are we now? We are in Canto XXVIII; it’s the — Dante encounters the one figure, the figure of Bertran de Born who was a Provençal poet, a Provençal poet whom Dante actually admires greatly. In the treaties on language that he writes, this famous — I have been referring to it, De vulgari eloquentia, he singles him out as — Dante singles out Bertran de Born as a great poet because he knew how to write the most difficult genre. He was Provençal poet, you know who they are — the area of Provence, wedged between the Ligurian part of Italy and France — because he was such a great poet, because he knew how to rhyme and write war poems. This is really the most difficult type of poetry, aesthetically very difficult to sustain and Bertran de Born was a genius at this. Now Dante places him among the so-called makers of discord. This is Canto XXVIII, Bertran de Born. Let’s see how — Dante starts with a reflection of war. I want to tell you a couple of things. This is a canto, a difficult canto. Dante begins with the story of by — with a reference to ineffability — would you please read the passages? I — my version is — my English version — from Canto XXVIII, the first paragraph, who could? Yes, do you want to do this — would you like to do it please? Professor Giuseppe Mazzotta: Very well read. Thank you so much, excellent. What is this metaphor? It’s the — we could call it the adoption of the so-called ineffability topos. You understand what I mean by ineffability topos? That is to say, usually it’s a device, a poetic device, where the poet admits the difficulty, or even impossibility of describing a particular reality. It’s called ineffability. It’s so sublime; it usually has to do with, let’s say, the vision of God. I cannot really go on: whoever has seen God, whatever mystic may have had a vision, they always fall into the contingency, the facticity of language that cannot quite grasp the sublime quality of what they have seen. Dante now deploys the same device for the world of — let’s call it for what it is, the evil world. It is as if Hell now has its own sublimity, a sublime quality that is a parallel and counter to that which Dante will witness in the divine spectacles at the top of Paradise. This is the first thing; language cannot quite be adequate to the reality it wants to represent. What he’s talking about now is all the — he wants to describe the whole of Hell. And all the limbs, the dismemberments of bodies from old wars cannot quite come close to what he has seen in this area of Hell. This is really the idea. What Dante first of all will go on describing is — first of all then, the question of the ineffability topos, which we’ll see what it means in the unfolding of the canto, and let me just continue actually with this. Then the canto really comes to a close with a meeting of a — with a poet Bertran de Born. So we go from the language of the ineffable and a language of the ineffable that is — has also this little detail, a reference to Livy, a Roman historian. And his voice, and his authority, are unquestioned. Livy cannot make mistakes. They are unerring in their chronicles, in their accounts of what they have seen, but somehow the poetic voice is not quite the same thing as the historian’s voice. You see what the tension is in the first few lines of the poem, and then the canto comes to a close with a different form of poetic reflection. Dante is here describing something altogether different, the meeting of Bertran de Born, and look how this scene — this is the end of Canto XXVIII: “I stayed to watch the troop and saw a thing I should fear simply to tell without more proof,” another, the threat of the ineffable once again. The poet is unable to represent — feels the difficulty of representing that — the extraordinary quality of what he has seen. Strangely mathematical language, the divided body of Bertran de Born: he’s a maker of discord and he’s being punished by having his own body divided from itself. I’ll come back to this metaphor in a moment, but the idea for now stylistically is that the two is one, and one is two; “how it can be He knows who so ordains.” A mathematical language, as if there is no equality even possible. Remember that was exactly the language that he was — he used for the metaphor, the impossible metaphor to contain all — the description of all the battlefields and all the dead people at the beginning of Canto XXVIII. I cannot find a metaphor that somehow can equal, can give an idea, a fair idea, a proportionate idea of what I have seen in these bodies one on top of the other, limbs accumulated one on top of the other. And now Dante’s using again the language of a quantity but sort of making us think that somehow there is some equality or some rationale in the disparity of one being two. I don’t know, he says, but He knows, God knows, who so ordains. I don’t know, that’s what the statement means. What is going on here? It’s a number of things. Let me just explain a few things. Why should the Bertran de Born, the poet, be the one who bears now visible, the mark of the division on his own body? We know that this is the way punishments occur. The idea of a punishment in Hell is that a punishment is just usually the prolongation of what the extension of what one has chosen to do in this life. You choose to create division and it means that that’s where you belong. You did not believe in the mortality of the soul and you are always after death you are going to be dead and so on. This is the reflection on punishment, or if you wish, on the justice that regulates this world of Hell or what Dante calls the retribution. The word he uses is, in Italian, contrapasso, means a counterpart I would say, or counter suffering. The last word in Italian is contrapasso which really means that there is — passo comes from passion, to suffer. You suffer equally for what you have done, that’s it. It’s — in a sense it’s really the — not quite, but the equivalent of the eye for the eye and the tooth for the tooth. The whole idea of retributive justice: there is a fair correspondence between what you have done and what you are going to suffer. And Bertran de Born seems to do — why, what is the issue with the body? The whole point of this canto is that Bertran de Born divides father and son. He violates a principle of — fundamental principle of political theology. Whereby, if some of you are interested in this issue, you can read the work of a historian, a great medieval historian who died actually almost half a century ago: it’s The King’s Two Bodies by a historian by the name of Kantorowicz. Some of you may know it. What is the idea of the king? What do you mean by the king’s two bodies? Yes, a king has always two bodies, the visible body that one has and also the mystical body of the royalty. They used to say in the Middle Ages, and we still do maybe, if you are into the news about royalty: the king is dead, long live the king. The king never dies. The king never dies because he has always two bodies; there are two bodies of the king. I may die as an incumbent but the office of the king always remains, this is fundamental. That’s one idea. So, by dividing the father from the son, Dante has Bertran de Born breaching the unity of the mystical body of the king. The two, father and son, are really one. The other metaphor that is behind it, which we already saw a little bit — sort of traced, finally traced in the canto of Ciacco in Canto VI of Inferno was the idea of the body politic that you may remember I mentioned to you. The famous fable of Menenius, who thinks that the body, the city is really constructed like a body: an organic set of correspondences, organic correspondences like the human body. There’s no difference between — there is a difference between patricians and plebeians. That’s Menenius’ argument, but they’re all part of one organic unified whole. That is true for the body politic, from a Roman point of view, but it’s the principle of so-called mystical body of the Church. Saint Paul, in the Letter to the Ephesians, refers to the Church as the mystical body of Christ a kind of — so that the State becomes a secular counter, a secular extension of this mystical body. The Church, we are all members, some of us thumbs, other are just toes, or whatever, hair or whatever in this body, mystical body of Christ. I mention this because Canto XXVIII you have a political focus on Rome, or Bertran de Born, breaching the unity of father and son but also reference to Mohammed and I know there are a lot of people who just find this just absolutely odious that Mohammed should be placed, the prophet should be placed here in this area of Inferno. The only argument that one can have about this, is that, for Dante, Mohammed was actually a member of the Church who created a schism, which is different from heresy. We saw the heretics in Cantos IX and X. The heretics are those who do not believe in certain tenets of the doctrine. The schismatics are those who want to double, who divide. The word “schism” in Greek means to tear apart the unity, the world of unity, and doubling it. So this is really the argument, the symbols and images of Canto XXVIII. Bertran thinks that there is no justice in this hellish world that he inhabits. All the ideas that the Ethics of Aristotle really account for devices that are so prevalent here, it’s just not true. Not only that’s not true, this idea of the retribution — is it an idea, this idea of the contrapasso, is that an idea that Dante really believes in? There is a lot of — what kind of justice is that — what are the justices that we have in Inferno? Let me just give you a little bit of — a piece of intellectual history about this whole issue. I want to make it very simple, because it’s really not a difficult problem anyway. It’s not that I’m simplifying the issue, it’s — there are two types: the people who think that the — the thinkers who think about this issue and of course, Aristotle in the Ethics. And Dante’s aware of the great commentary on Aristotle’s Ethics by Thomas Aquinas. He keeps them in mind and they discuss justice and they wonder what is justice. This is a great problem for Dante, because Dante is — I have been calling him a number of things, but he’s clearly a poet of justice. He really believes the whole point of his quest is to establish some degree of justice in his soul, try to find out justice in the city, and probe the possibility of some universal justice, as opposed to Lucretian ideas of anarchy and chaos in the cosmos. So there can be some continuity between the outside and the inside world. What is the idea of justice? What main types of justice do they have? They usually think about two types of justice. The so called — the retributive justice which is the one that we have in Hell here, but also distributive justice. Is Dante — is Dante aware of the two? Yes, it’s impossible not to think of the representation of the Wheel of Fortune in Inferno VII, as anything less than a case of distributive justice. The distributive justice follows an arithmetical model. That is to say, in a distributive justice, as imagined in the Wheel of Fortune, some have more, some have less. If someone has five, you want to establish some justice, you take away from one who has five and give to one who has zero or one, and you create some kind of equality. Distributive justice has equality as its aim. In retributive justice, things are a little bit different because if I say — and Aquinas reflects on this, this is not a concern at all of Aristotle — if I say an eye for an eye, and a tooth for a tooth, am I really establishing justice or am I just doubling the offense that has been perpetrated? If I — someone takes an eye, plucks an eye out of me, if I do the same to whoever has damaged me that way, am I having — am I being restored in my original position? No, that doesn’t happen. So how do you — how does one go around thinking about the whole question of retributive justice? Aquinas, and this also Aristotle, who goes on thinking, he says, well of course it’s always very difficult to find exact counterparts between crime and punishment. If a clown were to slap the king, it’s not enough for the king to slap the clown back because, one might say, well, its one slap. There is the violation of the office and then both Aristotle, that is implied, and it can never quite be restored by having the king slap the clown back. Both Aristotle and Aquinas say that’s why money was invented, so one can really give whatever, there is a principle of inequality, one can go on repaying it through other forms, other punishments. The fact is, I think, that Dante — first of all, I want to go back to the structure of the canto. It’s crucial that Dante should think about this fundamental problem of justice which is the aim of the ethical structure of the poem, in Inferno in particular, through the poet, through Bertran de Born. Not only through the poet, it’s Dante himself who has just been announcing the impossibility of finding through language the exact metaphor, the exact correspondence between a reality and its representation. What Dante is doing, is telling us how arbitrary are his own judgments in Hell, how the notion of a position in the way punishments and crimes are related are never quite reliable. This is the — to understand this, and I know that I did not ask you to read it for today, but I have to — I have a few minutes and I want to go the — ask you to turn to the very beginning of Canto XXIX because I think it becomes a retrospective gloss here on the problems that I’ve been trying to explain in Canto XXVIII. Dante goes through other forms of — he will enter the world of the so-called alchemists, those who are engaged in diabolical mutations, unnatural mutations, personifications, impersonators, disguises, etc., but before he gets there, there is a little long passage. It’s the first time in the whole poem that usually you know how — what the narrative economy of each canto is, Dante comes to the end of the poem — of a canto and usually closes off with the particular sin or the particular sinner, this is an exception. Dante goes into Canto XXIX and whatever situation he has been describing in Canto XXVIII keeps reappearing, it worries him and somehow — well let’s see what worries him about this. Once again numbers, arithmetical language. What is the measure? What is the — how do we measure? How are we going to determine what is the exact correspondence? Let me just give you a little aside about this. As you know, a great reader of Inferno, and actually he began his career as a commentator of Dante, was Galileo, the scientist. That was the first work that he did, he published a famous work on Inferno. He tried to find out what the actual size of the whole of Inferno was, just by going by this little detail that Dante gives, the radius. And he comes up with the idea that Inferno is as large as the city of Florence, which is something that he probably would have said anyway, whether it was a mathematical — there was a mathematical proof for it or just his own joke. I’ll leave it to you to decide. Let me continue with this. “If thou hadst given heed to my reason for looking,’ I answered then, ‘perhaps thou wouldst have granted me a longer stay.’ Meantime the Leader was going on and I went after him, already making my reply, and I added: ‘Within that den where I held my eyes so intently just now I think a spirit,” a kinsmen of his, “one of my blood, weeps for the guilt that cost so much down there.” Dante knows that a relative of his is in this den of Hell. What’s going on? How is this related to the previous canto? I think it’s fairly clear. Dante meets a kinsmen of his who has been killed and that death is unavenged and clearly is going to be unavenged, is going to remain unavenged. Dante is so overwhelmed by pity and compassion, but he does not say, nor does he promise that he’s going to go out and take revenge against the killers of his relative, Geri del Bello. What he is doing, he is redefining the notion of justice. The idea that justice is a doubling, or could be, of the crime. Someone is doing something, kills a kinsmen of mine, I’m going to go out and kill your kinsmen, because that’s the way justice could be understood. The idea of justice as revenge, as a way of establishing the precise relationship is what Dante is giving up here completely. It’s retrospectively a gloss on what I have been saying, that the notion of justice as the eye for the eye, or the tooth for the tooth, is no longer valid in this context. I think this is the beginning then of Dante’s worrying about what is the nature of God’s justice. What is — how arbitrary is my own claim of authority in describing these very issues, and continuing with this reflection as we shall see next time. Let me see if there are questions now about this whole problem — the problems we have been dealing with today or whatever problems you may have. Yes? Student: I’m curious to know, how knowledgeable Dante was of the Hellenic world since he did not read Greek. Professor Giuseppe Mazzotta: The question is how knowledgeable Dante was of the Hellenic world since he did not read Greek. My answer is yes, indeed, he did not read Greek at all. He — for that matter nor did Aquinas really read Greek. So he knew the Hellenic world through Latin translations of texts like Aristotle’s was being — the Ethics, the treatise On the Soul. Plato, he knew. He knew medieval romances that we’ll be dealing with, the so-called medieval romances deal with the matters of France, the matters of Rome, the matters of Brittany, the Roman of Alexander which is part of the Hellenic world. He knew the — he lived in Ravenna which was part, by the way, until the year 1200 and more and later was part of the exarchy, a Greek exarchy, the church of Ravenna Exarchate, as it’s called. So he knew this is where the resources and the conduit of his knowledge of the Greek world. Latin, and whatever survives in Latin, I mean for the philosophical schools of the Greeks. Clearly Cicero on the ends of man, De finibus, that is really the sourcebook for whatever he — I’ve been saying about Stoics, Epicureans, Aristotelians, etc. He had some idea, Dante had some idea of the Metaphysics. 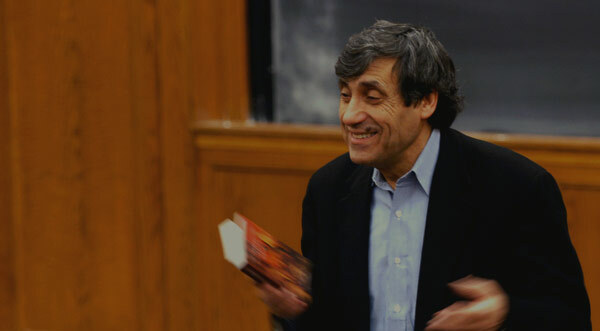 He writes about in the Convivio — he writes about the need to connect ethics and metaphysics for instance. So he knew — that’s what he knew. I could even add that I’m sure that — Actually there is going to be in Washington D.C. in about a year, we’re going to have a conference. We’re going to hold it in Washington for a number of reasons, but on Dante and the Greeks. So if you stay in touch with me, I’ll let you know what happens. One thing that we are really looking at are the mosaics, the art world, the relations, the connections with Greek artists who have been traveling and were in Rome, in Sicily — that’s what he knew. Yes? Professor Giuseppe Mazzotta: The question is going back to the problem of justice in Canto XXVIII and then XXIX. How can Dante go on having some kind of hesitations about the idea of justice and at the same time hold the place in Hell, and plays according to some criteria. The answer is — it will appear a little bit complicated, but I’m not sure that it’s complicated. This whole language of doubts about authority — that Dante is the authority of himself as the one who can administer justice, the authority about the — himself as even capable of remembering that which he has seen and therefore the authority of the poetic voice. This is very extensive and really goes into all directions, has a counter to it. That’s not the only aspect, the only facet of Dante’s text. The way I see that is that he’s also capable of taking on a prophetic voice, so that he appears as the one who has, by a singular grace of God, been chosen to explore the world in the beyond, which is really caught and understood in the most physical and direct way. So the two voices are simultaneously present. How does one condition the other? I think that that is really the tension of this poem. Dante is both a prophet and Dante is the poet who knows the arbitrariness of this construction. He’s the poet theologian and the poet — the poetic allegorist. The two voices are simultaneously present. What is the point of doing this? In many ways this makes the poem the actual experience of a pilgrimage. That is to say, it’s how you connect yourself, what kind of judgment do you give of what — of the realities that Dante’s representing, that is going to reveal to you yourself: who you are and where you are. It’s a way of shifting the point of Dante’s — the voice of the master who can tell you how things are, to the interpretative journey, to an allegorical journey where you’re going to decipher and all the time involve yourself in this story. This can be — can turn out — I think this is his wish. This story, which is his journey, can turn out to be your journey. You can tell your own story. Do you see what I’m saying? That’s I think the — that’s a very good question and I hope I have been clear in answering this. You may agree or not agree with it; that’s another story, but I hope I’ve been really clear in the answer. Yes? Student: I have one more question. In terms of the narrow issue of justice, do you think that Dante doesn’t have so much a problem with the system of an eye for an eye as with the idea that only someone with the intelligence of God could accurately see the correspondences and prescribe the right punishments for the crime. So it’s not that the actual system is bad, it’s just that Dante and humans can’t presume to make those judgments. Professor Giuseppe Mazzotta: The other question that follows, the follow up question is: does it mean that Dante may — can one say that Dante actually doesn’t have problems with the basic structure, but only with the human ability to grasp how it works? I would agree with that. However, I think that what he really has problems with, is the notion, which was a practice at the time, the notion of revenge; the way of understanding justice as revenge. Now even the Bible will go on and tell you that the — that ‘revenge is mine, so says the Lord,’ but Dante would say, that’s God’s voice and not the human voice. So he clearly has an objection to that. Is there some implication — because that’s really what I think you’re asking me, I hope that’s what you’re asking me, otherwise I’m completely off. Is there some implication that the universe itself, its divine economy, there may be something unfathomable and I would say yes, that the whole question of justice is something we cannot quite measure with human instruments. There is one great metaphor that Dante will give in Canto, I believe, XIX of Paradise where he goes back again to the question of justice and he talks about justice in terms of the salvation of the Hindus. Why shouldn’t they be here? I mean what — he wonders about that and the answer that he gives is, he says that the question of justice is like the sea. When you are really near the shore you see the bottom and everything seems to be — the waters are clear and transparent and you really seem to touch bottom and see the bottom. As soon as you go in, then the unfathomable ocean takes over and the foundation, the ground of it all remains invisible and inaccessible. Do you see what the argument — that’s the argument he goes on giving? It’s not an issue that he has resolved here once and for all, he will go back to these questions. Student: I have a question about the term you were using earlier, when you were talking about the ineffability, I couldn’t make out if you were saying the ineffability trope? Professor Giuseppe Mazzotta: Yeah, I called it — because it’s really jargon. The question is: I’m using ineffability trope. It’s more a — trope is a device — I called it topos which is a place where some — they talk about — topos is something that keeps, like a type, keeps repeating and can be used. Dante uses this idea of ineffability. What he’s really talking about, the impossible metaphor that can hold or represent two different realities and I think that that’s exactly the way he wants to think of crime and punishment: the relationship between crime and punishment, which is a metaphorical one, which is a kind of relationship that tries to equal — an equal relationship between two terms. I called it topos, a Greek word. We call it commonplace, it means place. Okay, we’ll see you next time.